Transform pure inspiration into something tangible. Make a mess! Transform pure inspiration into something concrete. This card is a big YES! to creative self-expression. If you have been frustrated, here is your chance to shed drudgery’s black, white & grey and plunge into vivid technicolor. Did you know that EGO stands for Edging God Out?! This card reminds us that creativity is a spiritual practice. We need self-esteem and some degree of confidence to create. Yet our “negative” ego tells us we have to do it perfectly the first time and every time. Put your ego aside and let the Divine Light of the ultimate creator flow through your heart and hands! You may already be clear about your passion: is it painting, sculpture, or pottery? Singing, piano, guitar? Poetry, fiction, memoir? Scrapbooking, weaving, or stained glass? Photoshop, photography, video? Maybe it’s pastries, cuisine of the world, or home décor? Or perhaps your thing is a new business, advertising, and fund-raising. There are endless ways to be creative, so get started! Just be sure you don’t hold back. All creativity is a process. It involves trial and more trial, experiments, sketches and tests. There’s generally a big mess and a lot of excess “scraps” to any project of passion. The important thing is to let go of perfection, have a great time, and go for manifesting your creative vision. If this card appears upside-down (reversed), you may be struggling with your schedule to make time for creative outlets. What can you move aside to feed this most important part of yourself? If you are giving yourself the time to create but the card is reversed, watch out for perfectionism. You may be too hard on yourself or have unrealistic expectations. Remember, focusing on how “bad” your work is, is as ego-focused as thinking you’re the greatest ever. Practice is the way! Let yourself get messy and don’t expect things to work out perfectly the first time. 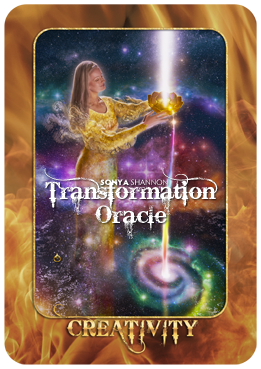 Check the other cards in your spread or draw a new card to see how you can let go of self-judgment, open up to deeper levels of creative expression, and make more time for your creative passions.